Through the Jedox Support Portal, you can contact our team of experts who will respond to any query regarding our product. The Support Portal is used for reporting incidents, concerns, for requesting assistance and for other complaints. If you are a Jedox customer or partner and you do not yet have a user account, please send an email to support.login@jedox.com. All communication following the initial ticket creation in the Jedox Support Portal can still be carried out via e-mail. This section offers you an overview of your company’s tickets. You can check details such as current status or age. You can filter your tickets by using the All/Open/Closed options above the list. Process, Subject, and Text are required. Please describe your issue as comprehensively as possible. You can also attach files, e.g. screenshots, log files, or reports. You can provide more information about the environment you use by using the different comboboxes. Not all the comboboxes are mandatory. Don´t feel obliged to fill them all; simply choose what you already know and what may be relevant for your case. Click the Submit button to submit your request. We will get back to you as soon as possible. After the ticket is successfully submitted, you will receive an automated e-mail including the assigned Jedox ticket number. In the Support Portal, you can see a detailed view of your submitted ticket. The arrow on the left top corner or My Tickets button in the header lead you back to the My Tickets overview. Your new ticket is displayed on the ticket list. Click a ticket in your list in the My Tickets section to see all the previous actions regarding this ticket. You can expand each entry and check its content, your mails and the responses from the support team. Use the Reply button to add new content to the ticket. Feature Voting Tool: Customers and partners are invited to share their feature requests. You can post your own request and vote for already existing ones. Known Issues: The overview of the already known issues. It allows you to check if your issue is already documented. 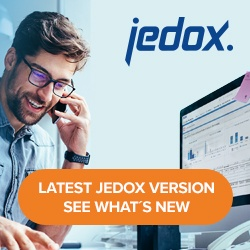 Knowledge Base: This comprehensive documentation of the Jedox Suite is updated and extended on a regular basis. Knowledge Base Archive: Documentation for older but still supported versions. For support purposes we prefer that no personal data is submitted unless absolutely necessary; wherever possible we would like to be provided with test data similar to production data and/or a test environment. Jedox will never use any personal data provided unless we have consent. Please view our Trust page on how we treat and protect personal data.